Our new Cathedral Campus will first of all be a powerful sign proclaiming our mission as a Church, to bring God’s Word and God’s love to the people of eastern North Carolina, especially the most vulnerable and those in most need. Located prominently in our state capital, in the midst of a university campus, clearly visible for all to see, our Cathedral will remind all who pass by of the spiritual values that we pursue as Catholics in this city and state. The Cathedral Campus will also proclaim our missionary history, standing on property owned by the Diocese and originally purchased by Father Thomas Frederick Price, the first North Carolinian to be ordained a priest, whose cause for Beatification is being considered by the Church. In time, additional structures are proposed to surround the new Cathedral. These structures will also be signs of our mission, helping the Church to strengthen the unity of the faithful in our Diocese through hospitality, pastoral care and administrative support. 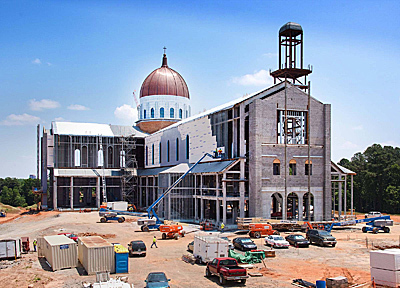 As the Mother Church belonging to all of the faithful, Holy Name of Jesus Cathedral will also provide a truly sacred place to celebrate the liturgical life of the people in our Diocese. This sacred place will unify our faithful, not only those who are natives of North Carolina but also those who have come to the Diocese from throughout our great country and from diverse cultures in Central and South America, Asia, Africa and Europe. At Holy Name of Jesus Cathedral, our Catholic faithful will celebrate and be initiated into the sacramental life of the Church through Baptism, first Holy Communion, and Confirmation. Already more than one thousand men, women and children seek initiation in the Church in the Rite of Election each year. In our new Cathedral, they will gather around the shepherd of the Diocese and be led into new Life in Christ. In this sacred place, all the faithful will be able to witness those who lay down their lives in Christ to be ordained as priests and deacons, those who commit themselves to serve Him through a life consecrated to God as religious, and those who reflect Christ’s love for His Bride the Church by joining themselves to each other in the Sacrament of Marriage. Finally, Holy Name of Jesus Cathedral will be for our Diocese a focus of prayer, as we ask God’s amazing grace, strength and blessing on His people at Diocesan Masses such as the Chrism Mass, the Wedding Anniversary Mass and the Altar Servers Mass. © All contents, including photos and art, on this site are the property of Holy Name of Jesus Cathedral, Raleigh, North Carolina.